Welcome to AZ Paradise Bouncers.Com! At AZ Paradise Bouncersyou'll find good old-fashioned values and great customer service. These are facts our customers come to expect. Rest easy... all of our inflatable bounce house rentals are licensed and insured because safety is always number one. All of our inflatable water slides and bounce houses are cleaned and sanitized after every use. See our new line of carnival games! At AZ Paradise Bouncers you'll always find great deals on the best party rental equipment like carnival games, kids party bounce house rentals, combo bouncers, water slides, rock climbing walls, mechanical bulls, Euro Bungees and so much more! Use the menu to the left to browse all the party rentals available, or click the "Book Online" button above and begin the reservation process. You're just one click away from reserving your party fun today! We specialize in large event, such as Peoria's Annual 4th of July Festival, City of Phoenix's Light Up The Sky July 4th Event, City Of Surprise Easter Event. Etc. The Euro Bungee fascinates adults and children alike. 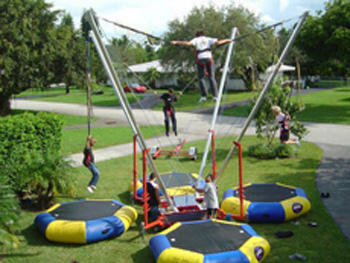 Everyone can enjoy unlimited trampoline jumps up to 30 feet, safely, which is not possible with an ordinary trampoline. Check Out The Bungee Jump! You won't need Night Vision to see this Wall at Night! 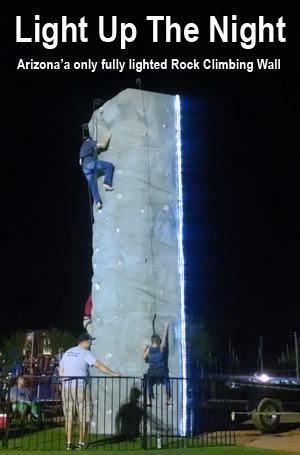 AZ Paradise Bouncers has Arizona's only fully lighted mobile rock climbing wall available for rent. This unit is great for those special events that run well into the night, offering extreme visibility that can be seen from the other side of the festival. Your guests will know right where to line up for tickets for this exciting attraction. Rock Climbing walls have become a favorite activity for all ages, and with this rental unit's versatility it doesn't matter whether it's day or night, it will be your centerpiece attraction. Our 3-person mobile Rock Wall is a wonderful additional to any event! Rent for your home, church, school, public, or company event. Our 25-foot mobile rock wall provides a challenge for participants and fun for spectators. Our rock wall offers an auto-belay system that ensures all climbers a safe and easy descent. See the exciting CROSS FIT video! Believe it or not they were climbing this rock wall blindfolded! A new spin on inflatable water slide design, the Rampage™ lets you slide up and down for an all around great time! Perfect for kids and adults for backyard parties, company picnics and corporate events! The Rampage™ features all the best safety features you've come to expect from AZ Paradise Bouncers. Get more information Rent Rampage Today! If you're in Arizona and looking for a "bounce house rental company near me", you've come to the right place! AZ Paradise Bouncers is proudly serving the following cities: Tempe, Chandler, Gilbert, Scottsdale, Peoria, Glendale, Phoenix, Avondale, Goodyear, Laveen, Surprise, and Mesa, AZ! We have all types of bounce houses for rent including inflatable water slides (dry slide options available too), interactive obstacle courses, and much more! We also have a huge selection of other party rentals to choose from including: mechanical bulls, carnival games, dunk tanks, rock climbing walls, tents, chairs, and a huge selection of themed bouncers and waterslides. Our selection of themed bouncy houses include: Hello Kitty, Spider Man, Disney Princesses, Transformers, Castles, and much more! AZ Paradise Bouncers has party rental equipment that can cater to all types of parties for both kids and adults. We supply party rental services for corporate events, childrens parties, toddler parties, church functions, and birthday parties in general, and will gladly go to any type of event that is in need of entertainment. 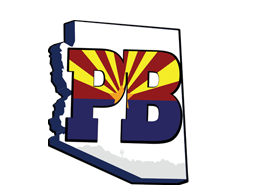 Out of all the bounce house and party rental companies to choose from in the Greater Phoenix Area, AZ Paradise Bouncers thanks you for stopping by our website!